To categorize the 39 countries surveyed into three categories – advanced economies, emerging markets and developing economies – we started with the World Bank classification of countries by income. The World Bank classifies countries into high income, upper middle income, lower middle income and low income groups. In general, we categorized countries that are considered high income as advanced economies; countries that are considered upper middle income as emerging markets; and countries that are considered lower middle or low income as developing economies. Next, we used the absolute size of the economy as well as the relative wealth per capita to determine whether the emerging markets and developing economies were classified correctly. To categorize emerging markets, we set a general cutoff point for 2012 gross domestic product (GDP), current prices at $300 billion U.S. dollars. Using this cutoff, Indonesia was recategorized as an emerging market and Lebanon, Tunisia and Jordan were recategorized as developing economies. While Chile does not quite meet the $300 billion cutoff, the country’s 2012 per capita wealth based on purchasing power parity is the highest among the upper middle income countries. Given this, we categorized Chile as an emerging market. Finally, we cross-referenced our coding of the countries against expert classifications, such as the International Monetary Fund. Below is a table which outlines the countries that fall into each of the three categories. 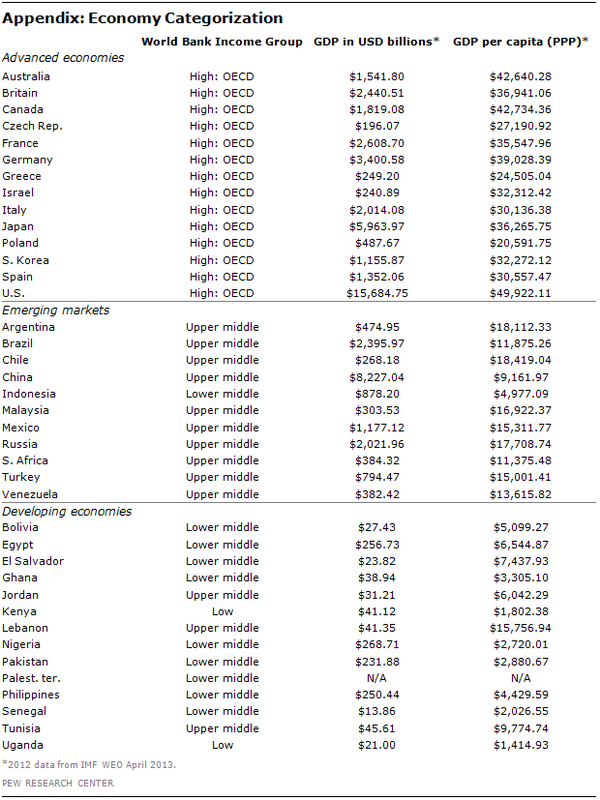 The table includes for each country the World Bank income classification, the GDP in current prices, and the GDP per capita based on purchasing power parity (PPP).